In many clinics, the electron treatment planning is still performed by "forcing" point-dose monitor unit (MU) calculations onto treatment planning system (TPS). TPS is only used to generate a relative dose distribution on the patient CT images, although the more complicated algorithms such as Gaussian pencil beam , and Monte Carlo , were released. The electron dose per MU is not always easy to predict due to the variation in electron scattering between different models of linear accelerators and treatment setups. ,,, In 2014, the American Association of Physicists in Medicine published task group (TG) report No. 71. With inclusion of the electron dosimetry considerations mentioned in other TG reports, ,, TG 71 explicitly proposed a unified definition for the dosimetric quantities in electron MU calculations and provided instructions to determine these quantities. It is beneficial to have such a well-established electron MU calculation protocol implemented in clinic. In keeping with common QA practices discussed in TG71,  it is essential to utilize an appropriate secondary calculation method. A recently released commercial secondary calculation program - Electron Quick Calc (EQC) module of a QA software Mobius3D (Mobius Medical System, LP, USA) - can be used for this purpose. The EQC utilizes the pencil beam redefinition algorithm based on two studies , and air-gap correction technique for extended source to surface distances (SSDs). Its different calculation engine and source of beam data make EQC a completely independent double-check of our modified TG-71 electron (mTG-71E) protocol. This work is the first report on the clinical implementation of TG-71 and EQC for electron dosimetry for Varian Clinac machines. This work describes two dose calculation methodologies and compares the calculation results with each other and with validation measurement. By providing a concise commissioning procedure and the benchmark data, this work intends to give readers a better understanding of the potential differences and limitations of using these two electron MU calculations in clinic. A new databook was developed to utilize an mTG-71E protocol as a primary electron MU calculation system for our Varian Clinac Series linear accelerators. The electron data in the databook were acquired based on the measurements on a Varian Clinac iX machine for electron energies 6, 9, 12, 16, and 20 MeV. A set of square Cerrobend cutouts was designed and crafted for each applicator (6 cm × 6 cm, 10 cm × 10 cm, 15 cm × 15 cm, 20 cm × 20 cm, or 25 cm × 25 cm). The cutouts were made in the following square field sizes (at isocenter): 2, 3, 4, 6, 10, 15 and 20 cm up to the size of the applicator. All measurements were made using a Wellhofer CC04 ion chamber (IBA, Nashville, TN, USA) (4 mm inner diameter) in a large (50 cm × 50 cm × 50 cm) water tank. The mTG-71E was evolved from TG-71 to adapt to our old data and measurement need, and we expected the differences between TG-71 and mTG-71E in MU calculation to be small for most clinical cases. Percentage depth doses (PDDs) data using various cutouts on a 25 cm × 25 cm applicator collected at 100 cm SSD were selected as representative data for mTG-71 calculations. As to the influence of applicator size on PDD, parameters including R 90 , R 80 , R 50 , and R p and the X-ray tail for 25 cm × 25 cm and 10 cm × 10 cm applicator were compared. Beyond d max , most PDDs agreed within 1 mm while the most noticeable difference was in the X-ray tail and the differences were <1.5%. 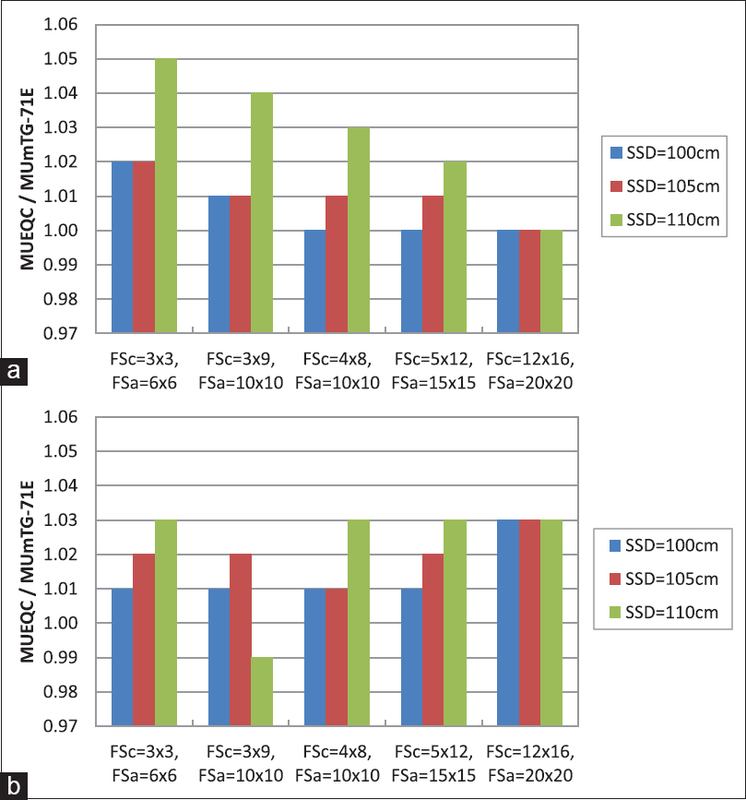 The dependence of PDD on SSD for all electron energies was checked by comparing the 15 cm × 15 cm open applicator PDDs for three different SSDs: 100, 105, and 110 cm. The difference was found to be <1 mm. To get air gap factors f air , the effective SSD was first calculated from the cutout measurements at different SSDs, following the TG-71 formalism. While TG-71 assumes f air and applicator size to be independent, our air gap factors include this dependency. In this study, Mobius EQC (version 1.5.1) was used as a secondary dose calculation program. The beam data used in EQC follow the description in TG-71 report. Specifically, reference applicator open field in EQC is 10 cm × 10 cm applicator open field; output factor is directly used; air gap factor is assumed independent of applicator size. These differences were considered when comparing beam data. The m-TG71 and EQC calculations use dosimetric quantities for various depths, field sizes (from 2 cm to applicator size) and SSDs (99-110 cm for m-TG71 and 98-115 cm for EQC). 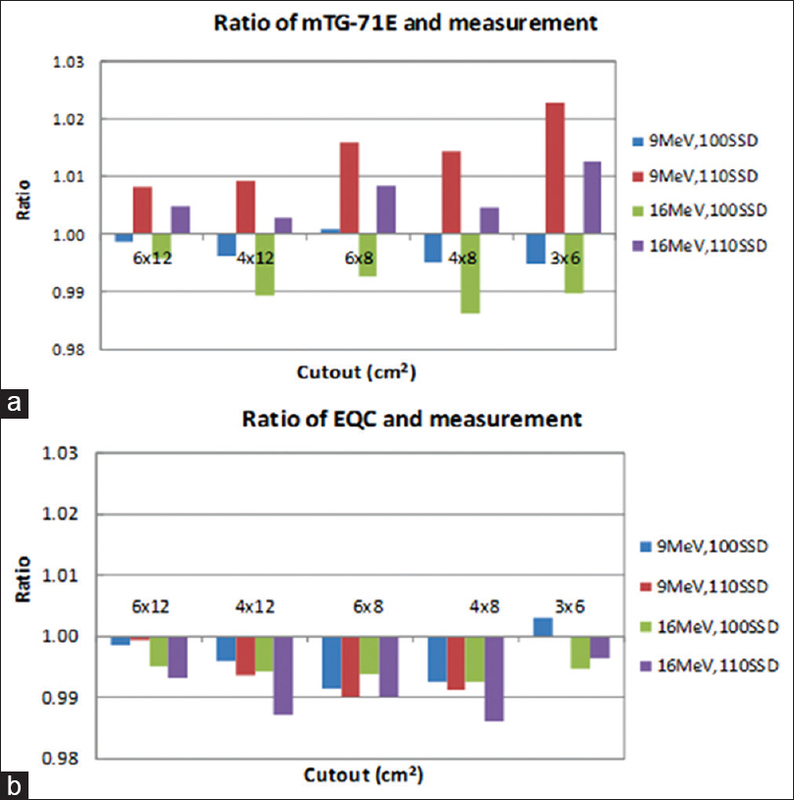 The calculation results using mTG-71E and EQC were compared for electron beams of energy 6, 9, 12, 16, and 20 MeV using various cutout sizes and SSDs of 100, 105, or 110 cm. Validation measurements were performed for electron beams of energy 6, 9, and 16 MeV, using a CC-04 ion chamber (Scanditronix Wellhofer, IBA Dosimetry, Bartlett, TN, USA) in a solid water phantom (Plastic Water, Best Industries, Nashville, TN, USA). Five customized cutouts of varying rectangular sizes defined at an SSD of 100 cm - 6 cm × 12 cm, 4 cm × 12 cm, 6 cm × 8 cm, 4 cm × 8 cm, 3 cm × 6 cm - were crafted. The irregular cutouts were not included in this work due to their variability and that their field sizes can be estimated using rectangular field sizes. The criteria for the selection of these field sizes included approximations to clinical scenarios and tests of the limitations of the algorithm in small dimension and varying aspect ratio situations. Cerrobend cutouts were designed to fit in either a 10 cm × 10 cm or a 15 cm × 15 cm applicator. The measurement depth was at a depth of maximum dose for each cutout field; SSD was either 100 cm or 110 cm. The measured ionization per MU was converted to dose per MU after correcting stopping power ratios and P repl at different depths. The dose per MU was then normalized to that at reference setup to eliminate day-to-day machine output fluctuation. The mTG-71E and EQC MU calculations for the square and rectangular cutouts are illustrated in [Figure 1] for 9 MeV and 16 MeV, respectively. Overall, the mTG-71E and EQC calculations give reasonably consistent results. The difference between two calculations is 0%-5%, and in most cases, it decreases with smaller SSD and/or increased cutout size. The results also show that the EQC MU is often systematically higher than mTG-71E because of different cutout factors and air gap factors used in two calculations. To validate the calculation results for mTG-71E and Mobius EQC, measurement using a CC04 ion chamber was performed in solid water for 9 MeV and 16 MeV electron beams. The dose ratios between mTG-71E calculation and measurement and between EQC and measurement are plotted in [Figure 2]. Both mTG-71E and EQC showed good consistency with chamber measurements: the mTG-71E measurement ratio varies within 2.3%, and the EQC-measurement ratio is within 1.5%. [Figure 2]a and [Figure 1] indicate that deviations between mTG-71E and solid water measurement and between mTG-71E and EQC often increase for lower energy, smaller cutout field, and larger SSD. To investigate the differences at the lowest energy, we did a chamber measurement for 6 MeV, with a 3 cm × 6 cm cutout at 110 cm SSD, and compared to mTG-71E and EQC calculations. Although mTG-71E-EQC difference is 5.3% in this case, both calculations differ from the measured value by <3%. This work focuses on the practical clinical implementation of a dose calculation system composed of two algorithms - the mTG71E and the Mobius EQC module - which were recently published/released. The Mobius EQC uses an independent algorithm and dataset and is becoming more frequently used in radiation oncology. To the best of our knowledge, there is no report/publication to verify this independent algorithm and its accompanying dataset. Through the discussion of the limitation of these two algorithms and setting the benchmark for their clinical implementation, this work also recommends the tolerance and action levels of different clinical scenarios with different calculation discrepancies of calculations. This work will be significant and useful for clinics using or planning on using TG71-based electron dosimetry and/or Mobius software. It is feasible to use a TG-71-based MU calculation and the EQC program as primary and secondary electron calculations or vice versa. In general, the mTG-71E and EQC calculations give consistent results with each other (0-5%) and with the chamber measurements in solid water (<2.5%) for different energies, field sizes, and SSDs as shown in [Figure 1] and [Figure 2]. The calculation difference between mTG-71E and EQC mainly resides in different cutout factors and air gap factor. We found these dosimetric quantities between mTG-71E and EQC all agree within 3%, except those for the 2 cm × 2 cm cutout field at 110 cm SSD and lower electron energies (i.e., 6 MeV and 9 MeV). The cutout factor difference sometimes cancels out the air-gap factor difference. In most cases, we expect that the cumulative effect of dosimetric quantity difference between mTG-71E and EQC on MU calculation is within 5%. When the scenarios involve low energy, a small cutout, and large extended SSD, we could expect a larger discrepancy between the mTG-71E and EQC results. We recommend 5% as the difference criterion between the two calculations since the inherent beam data and algorithm differences may lead to large discrepancies in unusual clinical circumstances (small fields, large SSDs, etc.). Our practice in using mTG-71E and EQC calculations is summarized as follows: if the difference between the two is within 3%, the MU calculated with mTG-71E is used for electron treatment planning; if the difference lies between 3% and 5%, a physicist is consulted and if the difference exceeds 5%, a patient-specific measurement will be performed and the physicist will determine the MU setting to be used. This study investigates the performance of mTG-71E and EQC for Varian Clinac accelerators exclusively. The dataset of other linear accelerator manufacturers (i.e., Elekta and Siemens , or of different design (e.g., Varian TrueBeam ,, may be quite different from what we use in this work. However, the same benchmark methodology can be used for the different machines. Therefore, this work is still useful to extend the applications of mTG-71E and EQC to other machines. The modified TG71 method and the Mobius EQC program have been implemented as an initial MU calculation and a redundant check for electron dosimetry in our clinic. Although they use independent algorithms and beam data, their dosimetric quantities for calculation are similar and their calculation results for various electron energies and setup are both reasonable. As these two calculation methods agree with each other and match measurement results to an acceptable level, they represent a reliable system to use for electron dosimetry. We propose a 5% agreement tolerance between both systems and recommend a patient-specific measurement for cases in which differences exceed this criterion. We would like to thank Dr. Katja Langen and Dr. Sina Mossahebi for their help in this work. Ebert MA, Hoban PW. A model for electron-beam applicator scatter. Med Phys 1995;22:1419-29. McParland BJ. A method of calculating the output factors of arbitrarily shaped electron fields. Med Phys 1989;16:88-93. Xu Z, Walsh SE, Telivala TP, Meek AG, Yang G. Evaluation of the eclipse electron Monte Carlo dose calculation for small fields. J Appl Clin Med Phys 2009;10:2834. Hu YA, Song H, Chen Z, Zhou S, Yin FF. Evaluation of an electron Monte Carlo dose calculation algorithm for electron beam. J Appl Clin Med Phys 2008;9:2720. Lee MC, Jiang SB, Ma CM. Monte Carlo and experimental investigations of multileaf collimated electron beams for modulated electron radiation therapy. Med Phys 2000;27:2708-18. Ebert MA, Hoban PW. A Monte Carlo investigation of electron-beam applicator scatter. Med Phys 1995;22:1431-5.
van der Laarse R, Bruinvis IA, Nooman MF. Wall-scattering effects in electron beam collimation. Acta Radiol Oncol Radiat Phys Biol 1978;17:113-24. Bjarngard BE, Piontek RW, Svensson GK. Electron scattering and collimation system for a 12-MeV linear accelerator. Med Phys 1976;3:153-8. Khan FM, Doppke KP, Hogstrom KR, Kutcher GJ, Nath R, Prasad SC, et al. Clinical electron-beam dosimetry: Report of AAPM Radiation Therapy Committee Task Group No 25. Med Phys 1991;18:73-109. Stern RL, Heaton R, Fraser MW, Goddu SM, Kirby TH, Lam KL, et al. Verification of monitor unit calculations for non-IMRT clinical radiotherapy: Report of AAPM Task Group 114. Med Phys 2011;38:504-30. Shiu AS, Hogstrom KR. Pencil-beam redefinition algorithm for electron dose distributions. Med Phys 1991;18:7-18. Boyd RA, Hogstrom KR, Starkschall G. Electron pencil-beam redefinition algorithm dose calculations in the presence of heterogeneities. Med Phys 2001;28:2096-104. Zhang GG, Rogers DW, Cygler JE, Mackie TR. Effects of changes in stopping-power ratios with field size on electron beam relative output factors. Med Phys 1998;25:1711-6. Followill DS, Tailor RC, Hernandez N, Hanson WF. Standard electron cone ratio values for Varian, Siemens and Elekta (Philips) accelerators. In: Enderle JD, editor. Annual International Conference of the IEEE Engineering in Medicine and Biology - Proceedings 2000;4:2557-60. Tailor RC, Followill DS, Hernandez N, Ibbott GS, Hanson WF. Predictability of electron cone ratios with respect to linac make and model. J Appl Clin Med Phys 2003;4:172-8. Beyer GP. Commissioning measurements for photon beam data on three TrueBeam linear accelerators, and comparison with trilogy and clinac 2100 linear accelerators. J Appl Clin Med Phys 2013;14:4077. Choi D, Patyal B, Cho J, Cheng IY, Nookala P. A practical approach for electron monitor unit calculation. Phys Med Biol 2009;54:N367-74.